When it comes to skin care and beauty products, i’m always trying to find the best natural and toxin free products that I can. This can be a tedious task and I use the App think dirty to help me get info about products that I would otherwise be clueless about. 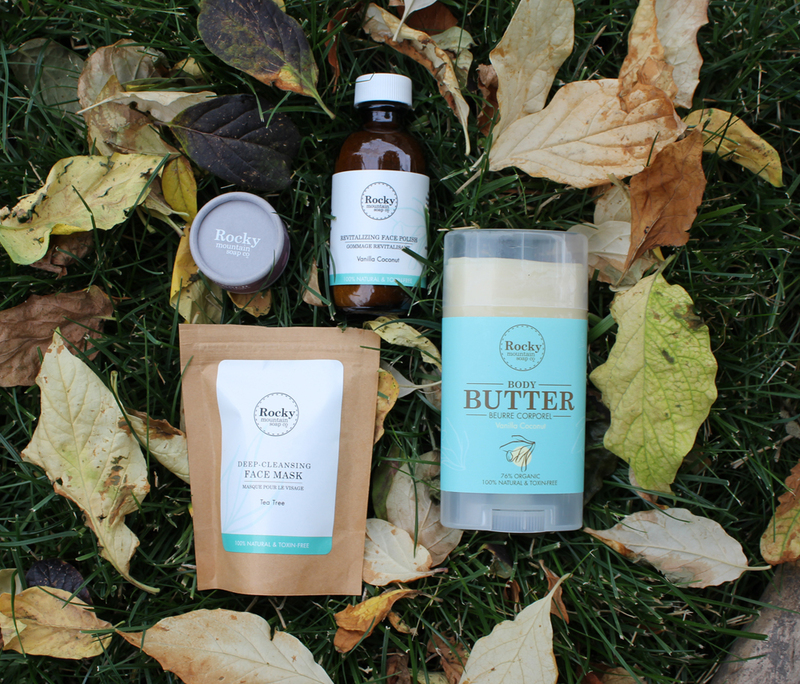 There are certain companies that just go ahead and make it so easy for you to find 100% natural products that are safe to use and work just as well as there un natural counter parts. One of those awesome companies is Rocky Mountain Soap Co! I’ve been using a variety of their products lately and I wanted to highlight a few of my favourites! Body Butter: I had no idea that moisturizer on a stick was a thing but let me tell you it’s awesome! It’s really convenient and great travel. I have the vanilla coconut version and it smells amazing! I also looked it up on think dirty just to confirm and it has a a rating of 1 which is awesome! Face Polish: Before this product, I hadn’t used any kind of face polish. I’ve used a few different types of exfoliating scrubs but nothing like this. I really like the light level of exfoliation that it provides. I also like that I can use it in-between uses of a heavier scrub. I try not to exfoliate everyday because it can be hard on my skin, which is pretty sensitive to begin with, so this product has been a great addition to my skin care regimen! Face Mask: I love doing weekly face masks so i’m always up to try a new one whenever I can. This tea tree mask is my current favourite. I have really sensitive combination skin so i’m always trying to find ways to keep it balanced. I find that cleansing masks work the best for me and are always my favourite! Lip Quench: I am the biggest fan of this tinted lip balm! It’s seriously one of my favourite products. I prefer more natural lip colours and tints are so perfect for that. I have the Dark Plum shade and it is amazing! It gives my lips just the right amount of colour and it also has a refreshing mint flavour, which is unexpected but awesome! *All featured products are C/O Rocky Mountain Soap Co and i’ve provided links to the products in the titles!